Much attention is paid to the "prevention of terrorism" in all parts of the North Caucasus. 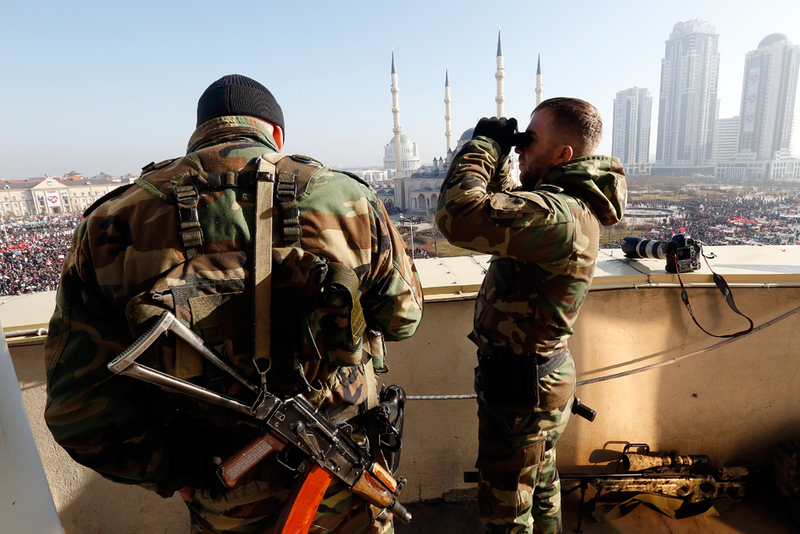 Russian specialists say that the number of terrorists in Chechnya and Dagestan are down. The state has managed to curb terrorism by gaining control over the population and the use of tough prevention techniques. The situation in the North Caucasus has become considerably more peaceful, with security forces there greatly succeeding in the fight against the terrorist underground. According to 2015 statistics, they have virtually destroyed the Caucasus Emirate (the local branch of Al-Qaeda), and eliminated 20 of the 26 leaders of groups that had sworn allegiance to the Islamic State. Other than law enforcement operations, local authorities are making great efforts at "terrorism prevention" among the population. According to experts, these combined measures have brought good results. Terrorist activity in the region is rapidly on the decline since the Sochi Olympics in 2014, when security forces launched a campaign to drive out the Wahhabis. However, these counter-terrorism methods, which often violate human rights, have drawn sharp criticism from human rights activists. The Moscow-based Memorial Human Rights Centre, in a recent report, provided a detailed analysis of the situation in the North Caucasus with a description of the policies used by the authorities. Much attention is paid to "prevention of terrorism" in all parts of the North Caucasus. The intensity of anti-terrorist activities in Chechnya and Ingushetia - considered by human rights activists to be hotbeds of Islamic extremism - have actually seen fewer police operations than other parts of the North Caucasus. In both republics, local MPs now regularly tour villages and towns to lecture about the dangers of religious extremism. Chechnya, for example, has developed the most sophisticated system of control over the population, with an established practice of ‘certification’ of young people. "Several months ago, the process of mandatory spiritual and moral certification was launched, which was renamed 'surveying' after a media firestorm," said Yekaterina Sokiryanskaya, director of the Russia and the North Caucasus project at the International Crisis Group. A file is opened on every young man or woman between 14 and 35 years of age, which contains not only their personal characteristics, but also an indication to which branch of Islam the family clan belongs. A key feature of certification is that a young person must have a guarantor from his adult relatives, whose name is also entered in the file (this is how Chechen authorities tried to formalize the practice of collective responsibility that exists in Islamic societies). Despite the fact that the guarantor may not be held legally liable if a young person joins a terrorist organization, (Russian law does not allow the imposition of collective guilt), the guarantor is risking a lot. In such a case he can face a series of very serious troubles, even finding that his house and property has mysteriously been burned down. Human rights activists point out the obvious risks to human rights violations in operating this system; a negative attitude within Chechen society, as well as its archaic and illegal nature. In Dagestan, authorities have their own system of "preventive supervision." Unlike Chechnya, it is not inclusive, and does not focus only on young people. They launched a database where law enforcement officers enter information on those who adhere to extreme Wahhabi Islam. The files contain detailed information about a person, and also a sample of his or her DNA. This supervision system, according to the news portal Caucasian Knot, covers about 100,000 people. As human rights activists say, you fall under suspicion if you look like a Wahhabi because of the shape of your beard or the manner of your dress; denunciation is also a common cause. But it is extremely difficult to have yourself removed from this database. Being included in the database means a ban on travel, Sokiryanskaya says. The police also conduct raids on Salafi mosques and detain visitors. Although, as one detective told Kommersant newspaper, they are closely monitoring "who is saying what in the mosques. No one is registered just for his beard." Although most analysts agree that there has been a decrease in the number of armed extremists in the North Caucasus, they note the failure to find a solution to the region's core issue, which feeds terrorism. This is very weak economic growth, unemployment and lack of prospects and work for young people. Experts also say that the reduction of extremism may be a temporary phenomenon associated with the fact that militants left the regions, attracted by high wages offered to mercenaries by the Islamic State. The Caucasus Emirate has been suffering lately from underfunding since payments from Al Qaeda and other sponsors are increasingly disappearing in transit. "Many extremists have simply left for the Middle East, so the position of the underground in these republics has begun to weaken," says Konstantin Kazenin, a senior researcher at the Russian Presidential Academy of National Economy and Public Administration. Some of them appear to be fighting today in Syria and Iraq, he said. According to the same official data, many more people in Dagestan left for Syria than for the forests and mountains. For those returning from the Middle East, already starting to arrive, their flow can so far be controlled, experts say. Ten people, for example, recently travelled to Russia through Europe, disguised as private car importers, and tried to join the underground in the North Caucasus. But they were tracked and eventually arrested.